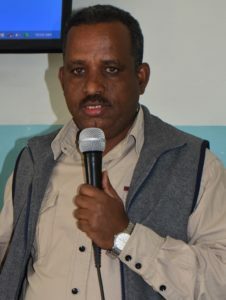 Mr. Saleh Ahmedin, Chairman of the National Union of Eritrean Youth and Students (NUEYS), said that nation building process is limitless homework of the youth at any stage and that the youth should relentlessly work for the development and prosperity of their country. Mr. Saleh made the comment at a seminar he conducted to the members of the 32nd round of the national service in Sawa on 29 and 30 September. At the seminar that was conducted under the theme “Role of the Youth in Nation Building”, Mr. Saleh pointed out that possessing political and physical infrastructure is basic for building developed national identity and economy. Mr. Saleh indicated that building physical infrastructure requires extended efforts of generations and called for persistent engagement for realizing the needs and desires of generations. Indicating that the training being provided in Sawa is part of process to nurture healthy, productive and skilled youth, Mr. Saleh called on the youth to be familiar with their history and develop creativity, Mr. Saleh also called on the youth to bequeath nationalism, unity, perseverance, persistence and self-reliance that are among the noble values of the Eritrean people. Indicating that such seminars have significant contribution in developing their awareness and understanding, the participants called on the NUEYS for establishing libraries with adequate books in Sawa.